The Michell Self Equalised (SE) Series is a range of equalised thrust bearing internals. The provision of interacting equalising levers behind the thrust pads allows thrust loads to be mechanically equalised across the complete thrust face. 8 thrust pads per bearing. 10 bearing sizes in the range. Thrust pads are available with offset pivots to maximise the oil film thickness and reduce bearing temperatures. Centre pivoted thrust pads are also available for continuously bi-directional machines if required. Interacting equalising segments are fitted behind the thrust pads to allow the thrust loads to be mechanically equalised across the entire thrust face. 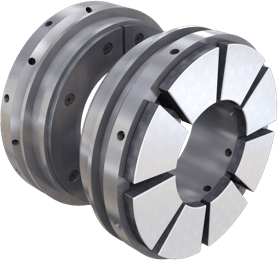 Thrust pads are mounted in retaining rings and can be supplied in halves or one piece designs. Flooded or directed ‘low loss’ lubrication alternatives. The use of directed ‘low loss’lubrication involves delivering oil via holes between the thrust pads to reduce bearing power losses.